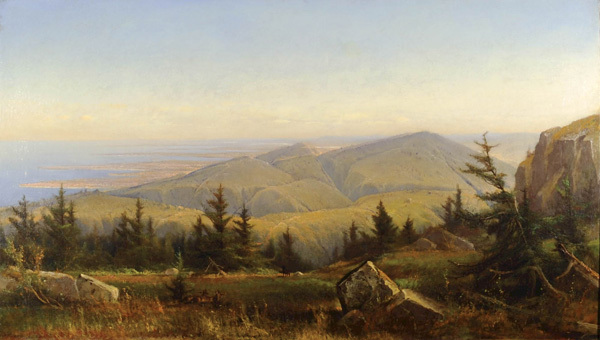 Gilbert Munger: Mount Tamalpais with a View of San Francisco Bay, CA. #270. Mount Tamalpais with a View of San Francisco Bay, CA.. 24 x 42, oil on canvas relined. not signed. This painting was found unframed at a tag sale and ended up at Alexander Gallery in New York City. By November of 2010 it was being offered by Gerald Peters Gallery of New York City. The title may come from the tag sale. Most Munger paintings are signed, so the lack of a signature here is puzzling. 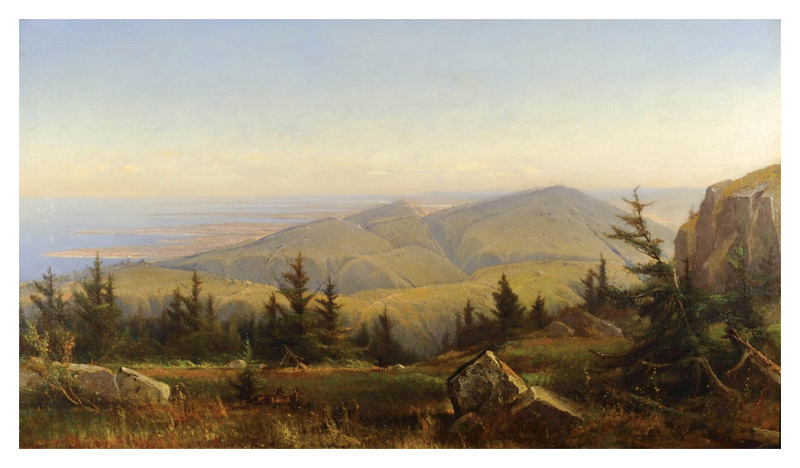 Several experts on Munger's paintings and history, however, feel certain that the painting is indeed by Munger and the the view is from the top of Mount Tamalpais in Marin County California, just north of the Golden Gate. The size matches other of his works from the 1870s. I support the authentication to Munger. If the view is indeed from the top of Mt. Tamalpais then it is probably the prospect seen towards the northwest towards the Pacific coast north of the mountain. Image provided by Gerald Peters Gallery, NYC.